If you or someone you know is interested in lampworking, then Corina Tettinger's book Passing the Flame: A Beadmaker's Guide to Detail and Design is a must have resource book. If you or someone you know is interested in lampworking (also called flameworking), then Corina Tettinger's book Passing the Flame: A Beadmaker's Guide to Detail and Design is a must have lampworking resource book. The best place to buy Passing the Flame is on Amazon, because you can save money on both the cost of the book and on shipping if you are an Amazon Prime member. Passing the Flame is the ultimate handbook guide for lampworking. For those of you who don't know what lampworking is, lampworking is the art of creating individual glass beads out of rods of molten glass on a mandrel with a small torch. Lampwork beads are small little pieces of glass art that can be strung on a chain for necklaces, bracelets and earrings. The most trendy lampwork beads right now are the high cost Pandora, Trollbeads, and Chamilia lampwork beads with a silver or gold inner core, but lampworking has been going on for centuries, as long as the use of molten glass blowing. You may be surprised to find that many artists make lampwork beads locally in your area either professionally or as hobbyists. Lampworking is a very addicting hobby, and working with the glass and torch can be set up in most home environments. 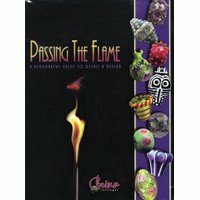 If you never buy another lampworking resource, you must buy Corina Tettinger's Passing the Flame. Passing the Flame has just been revised again, and the newest version is out and available for sale on Amazon. What is so wonderful about Passing the Flame by Corina Tettinger? Passing the Flame is a book that has stood the test of time. Many artists and hobbyists have used this book, and learned to make beautiful beads for themselves or to sell to others. Corina Tettinger has created a resource for lampworking that cannot be surpassed. The book has step by step instructions for just about every lampworking technique that you can use, as well as full color pictures throughout the book so that you can understand what your lampworking should look like while you are completing each technique. Although you have to spend a little more money to purchase Passing the Flame, you will never have to buy another lampworking book, so in reality you save a lot of money. One of the most frustrating parts of finding an appropriate book to help artists learn how to make lampwork beads is not understanding what level they are on, or if the book has thorough yet understandable instructions. The instructions in Passing the Flame are always accompanied by full color pictures, so that you can easily follow them through to the end of each section. This is good for both beginners and more advanced students as they learn the next technique in their portfolio to increase their skill at lampworking. They can check their lampworking results against the picture to make sure that they have gotten the technique right. There are many interesting techniques and tricks when it comes to lampworking. Glass is a very tricky substance when it comes to temperature. Glass is both a liquid and a solid, and due to the molecular structure of glass, you have to understand how to hold the glass, how to heat the glass, and how to cool the glass in order to get a perfect finished lampworked bead. Glass also changes color when it is heated, and it is not always easy to tell what color you are working with when it is hot. Another issue is that certain chemical properties of different colored glass react to each other which may or may not provide a problem or a solution to you as you do your lampworking. Corina Tettinger does an excellent job explaining all of these how to concepts in Passing the Flame. She also shows you tips and tricks for handling the molten glass, and how to create numerous special effects with the various glass types, and colors. You can get a full lampworking education by reading and studying Passing the Flame. One of the factors for lampworking is choosing your supplies. Many lampworking students start with a hot head torch set up that includes MAPP gas, hot head torch, rods of Italian glass, and accessories like a graphite paddle, mandrels, and bead release. This is an excellent set up for beginners because you can literally set your studio up just about anywhere, and you can learn the basics of lampworking. The other choice is a borosilicate glass lampworking set up using a propane and oxygen torch. 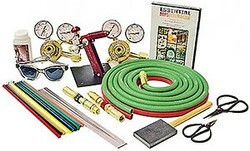 Borosilicate glass needs a hotter flame than can be produced by the hot head MAPP gas set up, so it is necessary to use a propane gas and oxygen torch. Although the techniques for making the beads do not change, the way the glass looks is different when you use borosilicate glass. Boro glass has a more ethereal look than the Italian glass like Murano, although you can get beautiful beads from either set up. Even if you live in a remote location with no other lampworking artists around, you can learn to be an expert lampworker with Corina Tettinger's Passing the Flame. Just go through the lessons one at a time and check your results against the results that Corina shows in the pictures. You will know immediately if you need to practice that lampworking technique more. And you don't just have to take my word for the worth of Passing the Flame. If you go to Amazon, and read the customer reviews, you will see that Passing the Flame is rated a 5 star with 166 customer reviews. Don't wait to buy Passing the Flame. You can get to the Amazon page by clicking the link under the picture above. Passing the Flame is an excellent gift for anyone who is beginning or already involved in lampworking. Definitely a book to have on your library if you are making lampwork beads. This page and all of my pages on Wizzley generate income for Lake Erie Artists Gallery and charities based on affiliate relationships with my partners, including Amazon, Google, eBay and others. Sounds like a cool hobby.